Before I show the results a few general remarks. As any other self-reported poll the following results are not representative of the general Star Wars fan or general population. It merely shows what the people who voted here on JTA (collectors) think about the movies! Some voters didn’t read the instructions or chose to ignore them, a flock of Porgs has been instructed to fly above their heads all day or to sit across the table looking at them with very big eyes. Any fractional points such as “.75” were rounded off to “.5”. Negative points were counted as “0”. Points above 10 were counted as “10”. So, here are the results! Please click on the graphic to see the large version, in case you can’t easily read the numbers! To the surprise of no one The Empire Strikes Back is the winner! Solo finds itself right in the middle. Its score is not fantastic, but very solid, I think it’s a fair score for the movie. The Last Jedi is in last place, and by a wide margin too, almost a full point behind the second worst rated movie Attack of the Clones. We will discuss this further below. Of note is a general trend for the movies, the lower the score, the higher the standard deviation, i.e. the less well liked a movie is, the more opinions are divided. Star Wars fans on JTA agree on what’s good, but they don’t agree so much about what’s bad. Next up is the ranking of the trilogies (the two anthology movies are their own series here). As before, please click on the graphic to see the larger version! The Original Trilogy is the clear winner, and the votes for the three OT movies agree a lot, there’s not much spread here, as can be seen by looking at the very low standard deviation of 1.31. The two Disney Star Wars Anthology movies fare pretty well, they are the second most popular movie series. And the prequels are more popular than the sequels. 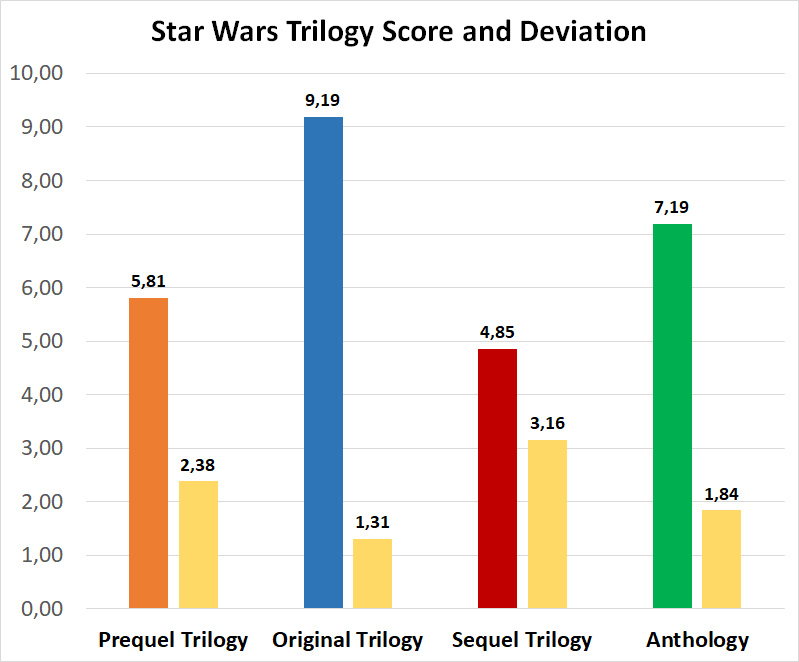 Opinion on the sequels is very much divided, as can be seen by the very high standard deviation of 3.16. This will be discussed soon. So, these are the votes and the opinion on JTA, at least among the people who participated in the survey. But how does the JTA poll compare to the IMDB and the Rotten Tomatoes Audience Score, both of which have many more users who voted? Let’s take a look at all three scores to see if the collector fanbase on JTA has a very different opinion than the more general audience at both IMDB and Rotten Tomatoes! This graphic has the JTA results in blue, IMDB in orange and the RT Audience Score in green. Overall, which might be surprising perhaps, all three scores agree pretty well. There are only some noteworthy differences. 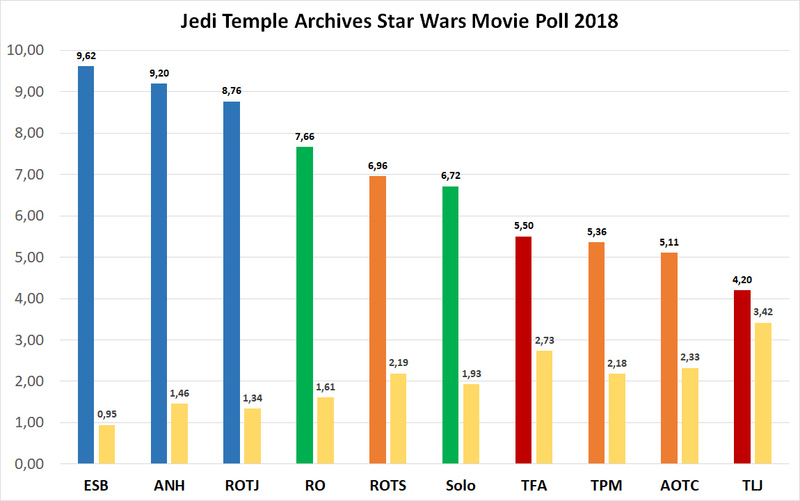 So, while the JTA poll is not representative, and neither are the IMDB and RT scores, all three user scores are in good agreement, and the JTA and RT scores are even very similar. Star Wars fans who vote on these platforms, no matter if they are collectors or not, have similar opinions on the quality and ranking of the Star Wars movies. When I analyzed the data a trend showed pretty early, opinions for both The Last Jedi and The Force Awakens are very much divided. 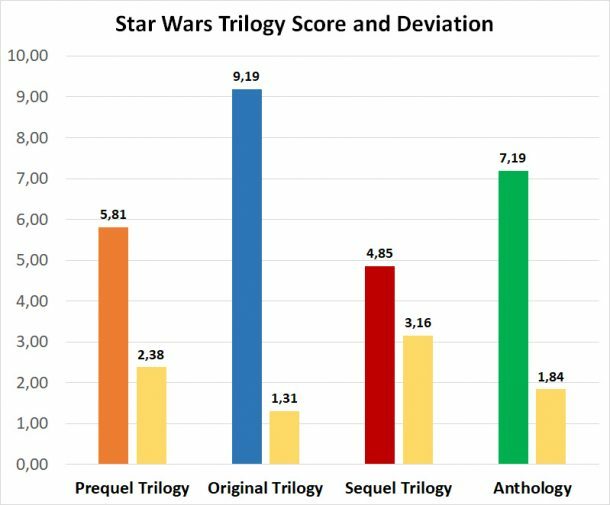 You can see this effect by looking at the standard deviation for their scores, both movies have the highest standard deviation of all Star Wars movies. TLJ has a deviation of 3.42 and TFA of 2.73. The red bars are votes worse than 5, the green bars are the votes better than 5. As you can see some people really like The Last Jedi. But a majority of voters dislike The Last Jedi. There were a total of 65 “0” ratings across all of the movies. The Last Jedi accounts for 34 of them, or 52.31%. About one fifth of all the votes for The Last Jedi were a “0”. The Force Awakens shows a less extreme, but similar distribution of votes. The Last Jedi and The Force Awakens combined account for 45 “0” ratings – 69.23%. The user ratings for The Last Jedi show a similar trend on IMDB. It’s the movie with the highest percentage of “1” ratings (1 is the lowest score on IMDB) of all Star Wars movies. So what’s the general takeaway? The JTA poll is more for fun, it’s a snapshot of the opinion from collectors who decided to vote. That being said, it still aligns quite well with the IMDB score, with the only real difference the scores for The Force Awakens and The Last Jedi which fare much better on IMDB. 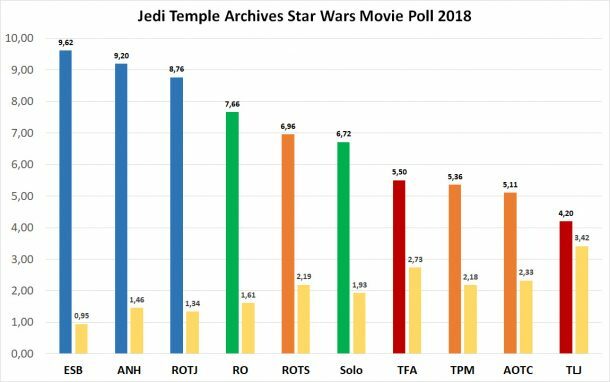 The JTA poll is pretty much in agreement with the Rotten Tomatoes Audience Score, only difference the rating for The Force Awakens, which is substantially better on RT. The Original Trilogy is universally loved by the vast majority. 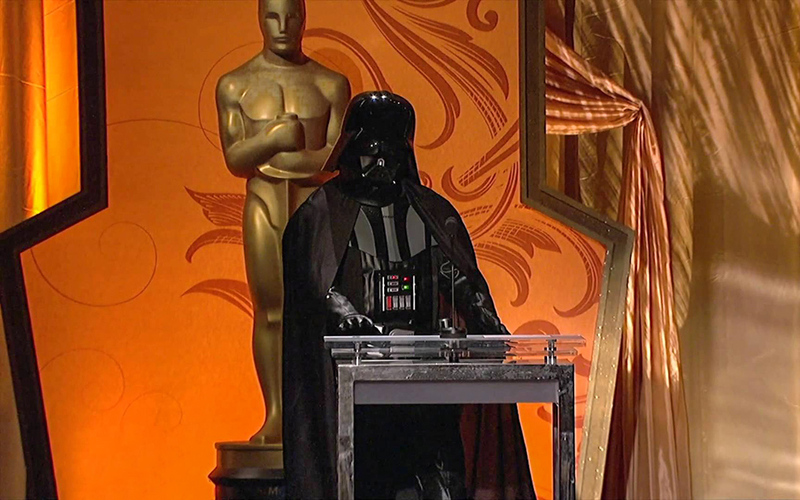 The Anthology movies are well liked and there’s also much agreement about that. The Prequel Trilogy is struggling, but overall opinion is still favorable, however there’s quite some disagreement about the quality of the movies. The Sequel Trilogy is disliked by a majority, opinions are very much divided, you either like or really, really dislike the sequels. 71.51% of the ratings for The Empire Strikes Back are a perfect “10”. Impressive, most impressive! It will be interesting to see how and if things change with Episode IX! So, what do you think of the results? Is it as you expected? 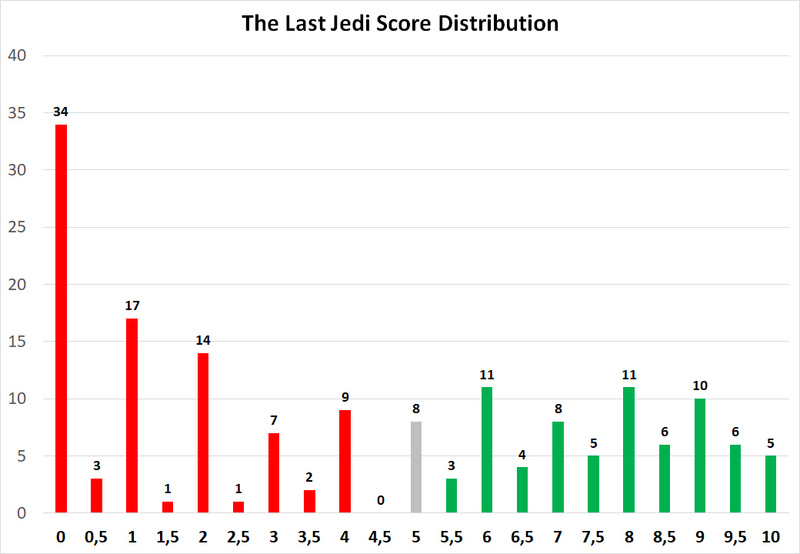 Did you think The Last Jedi would have had a better score? Are you surprised that the poll on JTA with only 165 fans participating still aligns pretty well with scores on IMDB and Rotten Tomatoes which have tens of thousands or hundreds of thousands votes? Do you think Solo is where its supposed to be on the list? Your Most Favorite Star Wars Battle! Pick Your Favorite Star Wars Battle! Previous Article: Do You Feel That Action Figures Are 'Punishment Toys' For Kids Today?